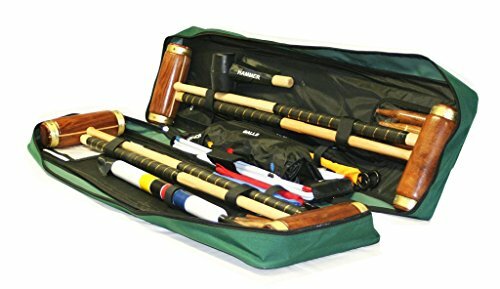 A well-made traditional style Croquet set with regulation balls and hoops. The set comes presented in either a beautiful wooden storage box featuring carry handles for easy transportation or a convenient Tool kit carry bag featuring designated compartments for each accessory. Mallets with cylindrical brass bound heads and an inlaid sighting line. Regulation composite balls - 16oz, 3 5/8 inch diameter. Not to be confused with the Jaques Hurlingham Croquet Set. If you have any questions about this product by Garden Games, contact us by completing and submitting the form below. If you are looking for a specif part number, please include it with your message.